A new species of lobopodian, a worm-like animal with soft legs from the Cambrian period (541 to 485 million years ago), has been described for the first time from fossils found in the Burgess Shale in the Canadian Rocky Mountains. The new species is called Ovatiovermis cribratus. A team of researchers have discovered fossils of kinorhynch worms Ð commonly known as mud dragons - dating back more than 530 million years. The historic find - made in South China - fills a huge gap in the known fossil record of kinorhynchs, small invertebrate animals that are related to arthropods, featuring exoskeletons and segmented bodies, but not jointed legs. A spiky, wormlike creature with 30 legs - 18 clawed rear legs and 12 featherlike front legs that likely helped it filter food from the water - once lived in the ancient oceans of the early Cambrian period, about 518 million years ago, a new study finds. The critter is one of the first known animals on Earth to develop protective armor and to sport specialized limbs that likely helped it catch food, the researchers said. It's a bit of a large animal for this time period. The largest specimen is just under 10 centimeters [4 inches], which, for a wormy thing, is quite mighty. 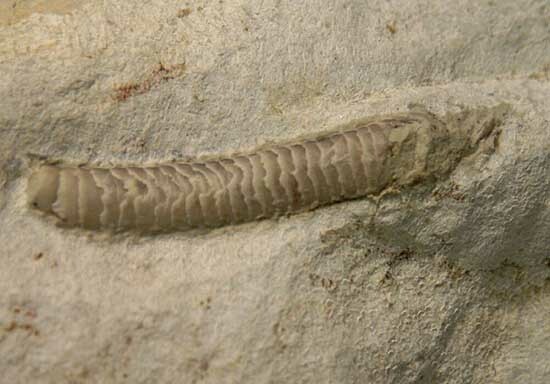 One of the most bizarre-looking fossils ever found -- a worm-like creature with legs, spikes and a head difficult to distinguish from its tail -- has found its place in the evolutionary Tree of Life, definitively linking it with a group of modern animals for the first time. The animal, known as Hallucigenia due to its otherworldly appearance, had been considered an 'evolutionary misfit' as it was not clear how it related to modern animal groups. Researchers from the University of Cambridge have discovered an important link with modern velvet worms, also known as onychophorans, a relatively small group of worm-like animals that live in tropical forests. When researchers first discovered the fossil worm Hallucigenia in the 1970s, they were so perplexed they identified its head as its tail and its legs as its spines.Now, this 505-million-year-old worm, whose fossil was discovered in Canada's Burgess shale, has been put to rights - and even given a place in a family tree. According to a new study of the creatures' odd claws, Hallucigenia sparsa is the ancestor of modern-day velvet worms, which are strange, sluglike creatures with centipede-style legs. The finding is surprising because it rewrites the evolutionary history of spiders, insects and crustaceans, said study researcher Javier Ortega-Hernandez, a paleobiologist at the University of Cambridge. Most genetic studies have found that these arthropods are close relatives of today's velvet worms, Ortega-Hernandez said in a statement. But the new study finds that velvet worms are only distant cousins of arthropods. Using the world's largest microscope, paleontologists have peeked inside tiny fossils of 500-million-year-old embryos, each about the size of a grain of sand. Previously the only way to find out what was inside such fossils was to slice them open and put them under a microscope. Even if scientists were willing to do that, many fossils would be destroyed in vain. That's because most embryo fossils preserve only the outline of the animal, with nothing inside. The fossil embryos were found in China and Siberia and are members of wormlike ancient species called Markuelia and Pseudooides.